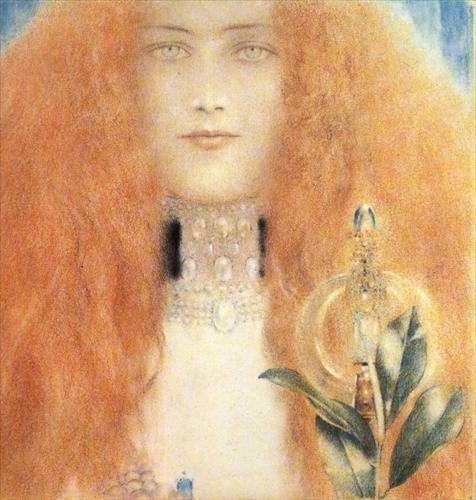 Fernand Khnopff (1858 – 1921) was a Belgian Symbolist artist whose distinctive style would win him great success during his lifetime, and influenced other artists in the movement, most notably Gustav Klimt. 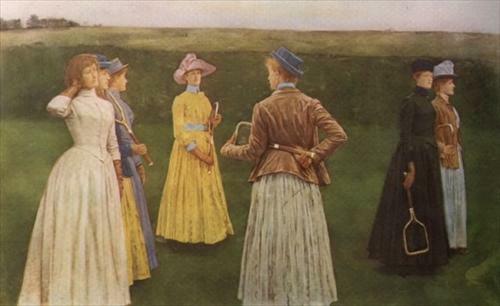 While Realism was the most advanced style in Belgium at the start of his career, it wasn’t enough for Khnopff: Jeffery Howe states that he ‘insisted that art must suggest the essential mystery behind the visible facts and facades.’ His work is full of allegorical imagery and mystical allusions. He almost exclusively used his sister Marguerite as his model, and his relationship with her was intense and jealous. In many of his paintings of her, he accentuates her jawline to create a more androgynous appearance, blurring the boundaries between gender, creating a fluid sexuality. There’s an eeriness to his work, and a sense of isolation that is at once compelling and discomforting. The Portuguese writer Mario de Sa-Carneiro (1890-1916) is a somewhat tragic figure: he committed suicide in Paris when he was just 26. 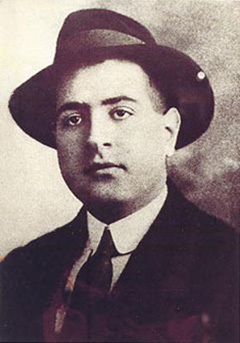 Although he did not produce much in his short life, he is considered to be one of the most influential writers of the Portuguese Modernism movement. His poems and stories almost always toy with conceptions of what is real, and delve into the Decadent concepts of madness, excess, sickness and sexuality. There is a general sense of distaste towards, and fear of, women in his writing, as well as a strong homosexual undercurrent. Sa-Carneiro writes in the first person, ‘I’, forcing the reader to confront the speaker head-on, and experience the intensity of the story being told as if it is being related directly to them. It also seems to be a method of personal exorcism for the author. 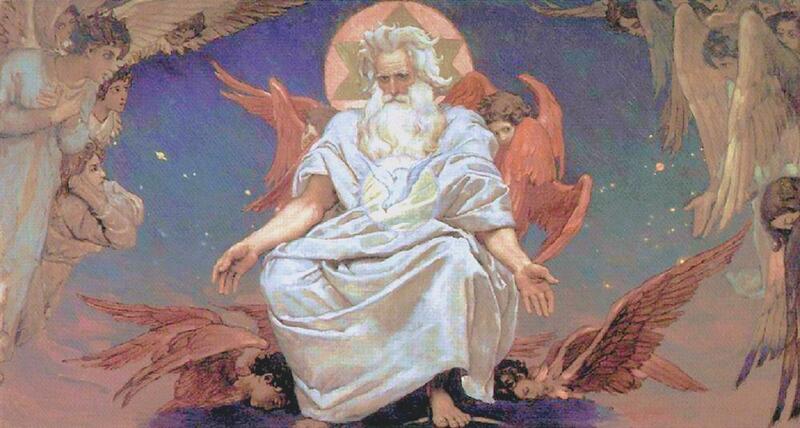 Plagued by fears of madness, he purges the horrors and fantasies of his mind into his work in the hope of absolution. Lucio’s Confession is no exception to this rule. 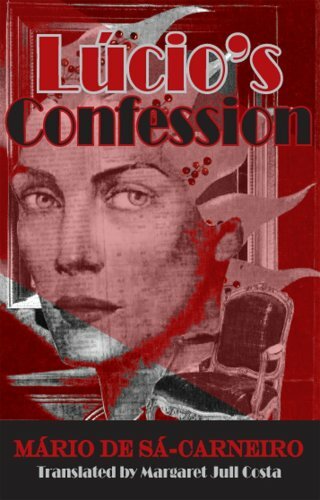 It is a remarkably intense novella, consisting of the written confession of Lucio, a writer, detailing the events leading up to his accusation for a crime he did not commit. He tells the story of his intense friendship with the enigmatic poet Ricardo de Loureiro, from their meeting at a decadent party in Paris. Ricardo is a tortured eccentric, plagued by his inability to truly possess the people he cares for. He eventually marries a beautiful and mysterious woman named Marta, and she and Lucio soon begin an affair. However, it is not long before Lucio begins to question who Marta really is and whether she even exists at all. He descends deeper and deeper into confusion and madness, until events culminate in tragedy. It’s a quick read, comprising only 121 pages, but one which leaves a lasting impression. I have never read anything quite like the works of Mario de Sa-Carneiro. I haven’t discussed Baudelaire for a while now, which is nothing short of a travesty. Here is another of his infamous banned poems, condemned for being far too explicit at the initial publication of Les Fleurs du Mal in 1857. 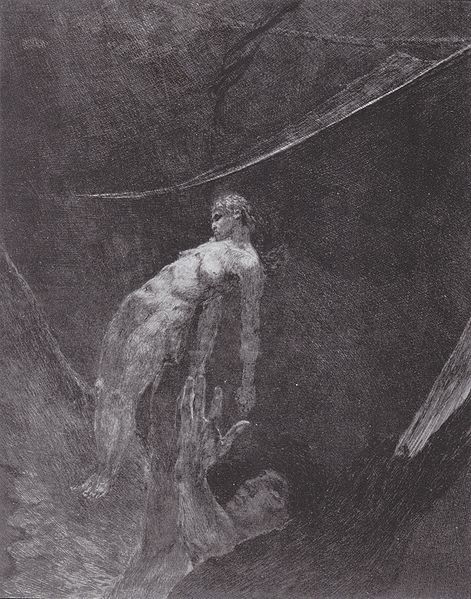 It’s called ‘The metamorphosis of the vampire’, and it’s fraught with sexual guilt and religious allegory. 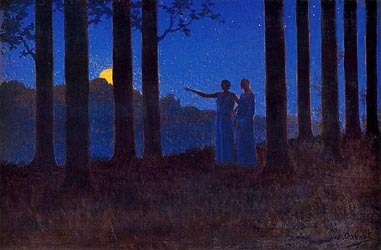 La lune, le soleil, le ciel et les étoiles! Qu’une outre aux flancs gluants, toute pleine de pus! 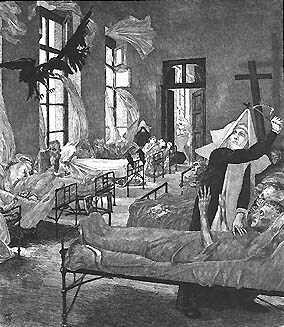 Of losing old conscience in the depths of a bed. And I make old men laugh with the laughter of children. I am the moon and the sun and the sky and the stars! An old leather bottle with sticky sides and full of pus! Which the wind swings in winter nights. As we know, the femme fatale was one of the staples of Decadent literature. 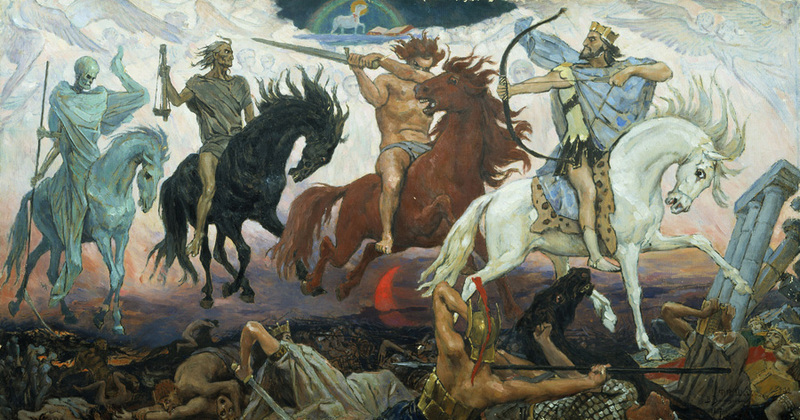 Carnality and sexual desire are aligned with the demonic, and acting on desire produces only destruction and loathing. 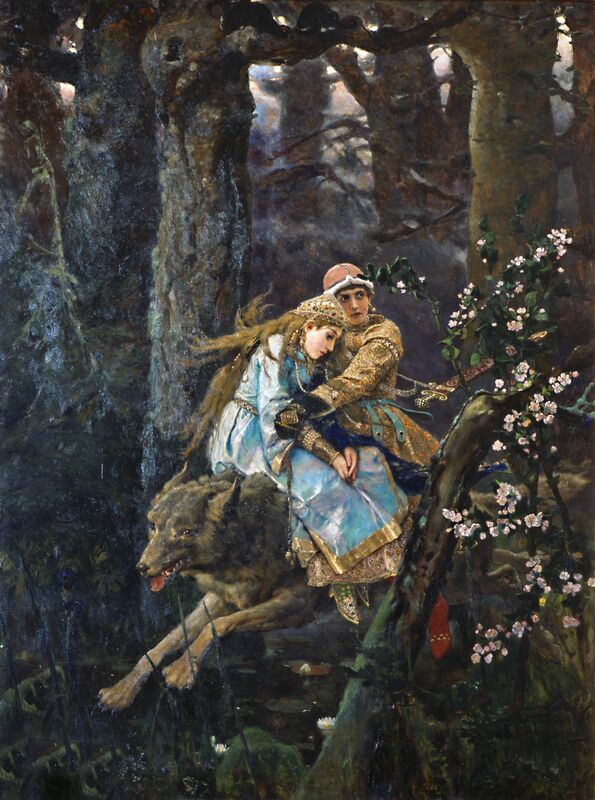 Once again, a predatory female preys on a passive man. It is interesting to compare this with ‘Allegory’ another of Baudelaire’s poems about a prostitute, but one where the woman remains somehow pure and good in spite of her profession. 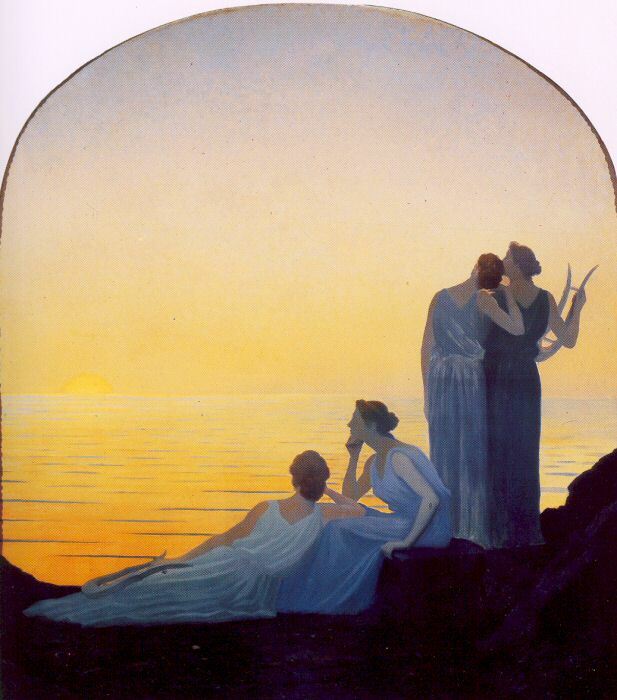 Alphonse Osbert (1857-1939) was a French Symbolist who exhibited at the Rose+Croix salons (founded in 1892 by Josephin Peladan with the intention of providing Symbolist art with ideological underpinnings). 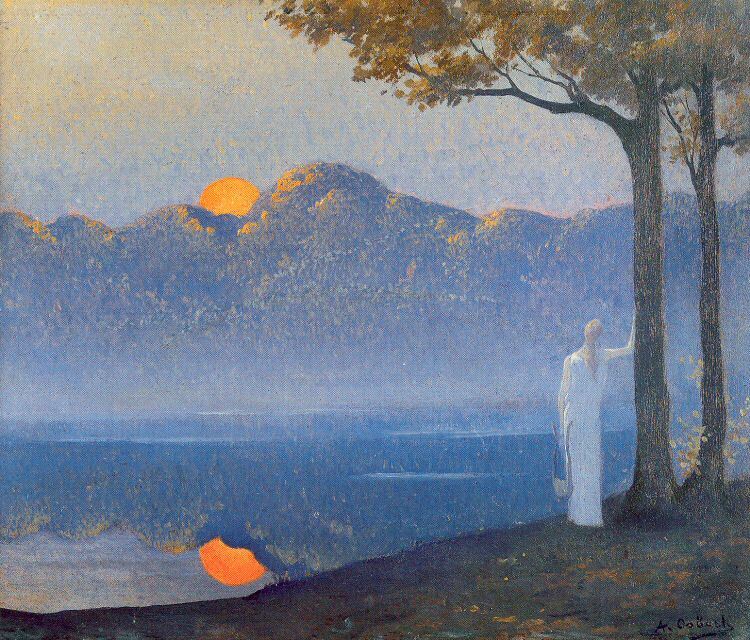 He was influenced by Pointillism, and his paintings have an ethereal, otherworldly quality to them, and I think his depiction of light is quite lovely. I found this lovely animation dedicated to the life and works of Oscar Wilde, by lucylou21, and I thought I’d share. 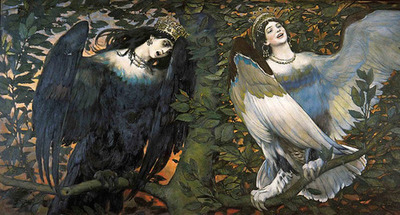 Viktor Vasnetsov (1848-1926) was a Russian artist who, while not directly affiliated with the Symbolist movement, nevertheless exhibits many of its traits in his work: religious iconography, mythology, dark sensuality. 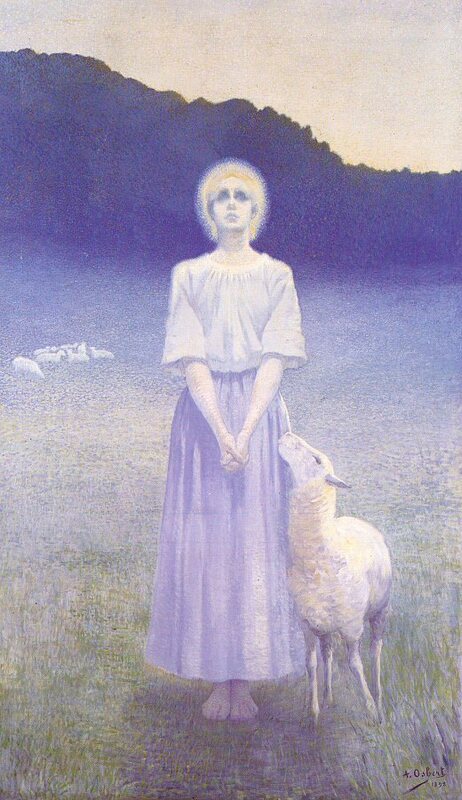 He was one of the key figures in the evolution of Russian art in the nineteenth century as it moved from realism to something that was more in the style of Art Nouveau. 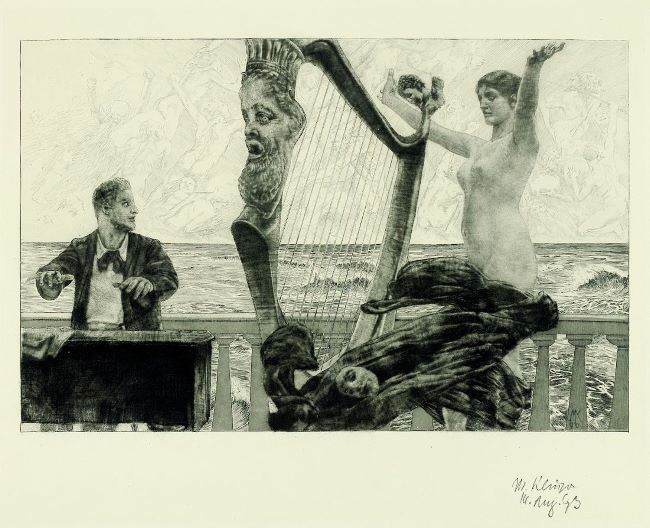 In later years, he worked in Kiev with Mikhail Vrubel, whose work was admired by many Symbolists, and had a lot of influence on the younger artist. 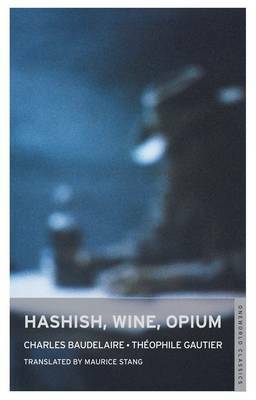 I recently finished reading a collection of essays on narcotics by Theophile Gautier and Charles Baudelaire, Hashish, Wine, Opium (trans. Maurice Stang). It was an interesting read, not only because it provided insight into the experimentations made by members of the Decadent movement with certain drugs, but also because it provided a wonderful contrast between the attitudes and literary styles of the two French masters. In his introduction, Derek Stanford writes about how drug use heavily influenced the use of ‘synaesthesia’ – a blending of the senses – frequently used in Decadent writing. Smells are seen in colour and music has a taste. He also comments on the different ways the subject matter is approached by the two writers – Gautier as a poet, Baudelaire as a scientist. These differing attitudes become even clearer upon reading the essays. Gautier emphasises the fantastical, spiritual elements of drug consumption in his three essays (which are really more semi-autobiographical works of fiction), ‘The Opium Pipe’, ‘The Club of Assassins’ and ‘Hashish’. He dwells on the wonderful – and sometimes terrifying – visions that the consumption of narcotics provides, and indicates that they can be a source of artistic inspiration. “I could hear the very sounds of the colours. Sounds which were green, red, blue or yellow, reached my ears in perfectly distinct waves” (p.59). “Hashish is not favourable to action. It does not console like wine; it merely develops to an immoderate degree the human personality in the circumstances in which it finds itself at a given place and time” (p.89). I enjoyed the book. 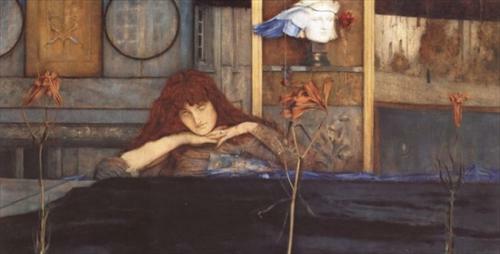 The use of drugs in the 19th century and its influence on art and literature is a topic I find very compelling, and it’s interesting to examine the attitudes of two of the great frontrunners in the Decadent movement towards the subject. 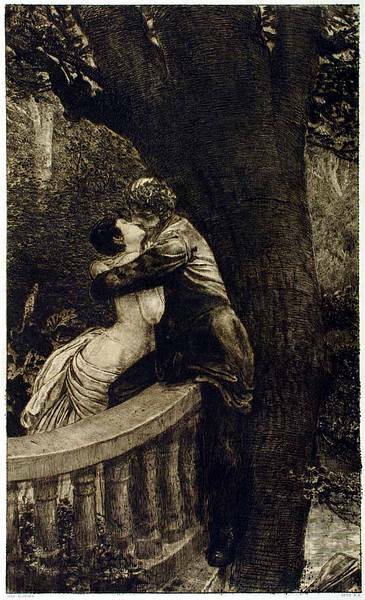 Max Klinger (1857-1920) was a German-born artist whose work had a strong influence on other Symbolists such as Otto Greiner and Alfred Kubin. 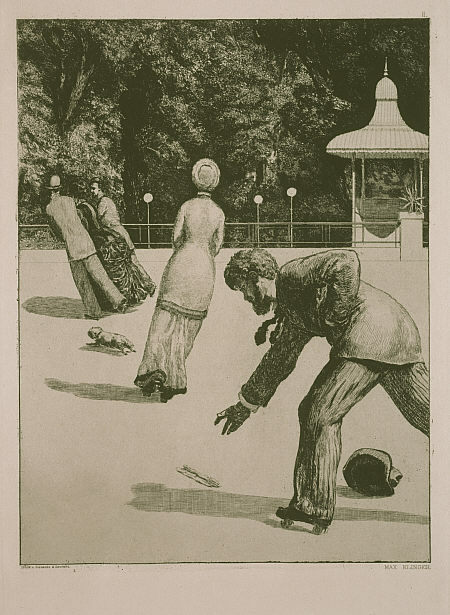 He achieved much acclaim during his lifetime for his fantastical engravings, the most famous perhaps being the Paraphrase on the Discovery of a Glove series. 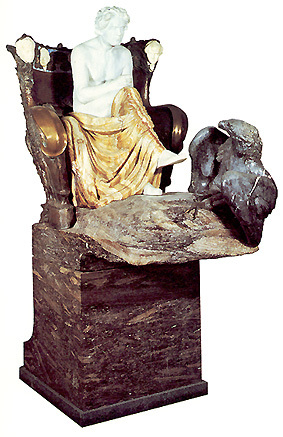 He was also a talented sculptor, as witnessed in his remarkable statue of Beethoven. I’ve just started studying for a PhD, and until I get settled and have time to organise a proper post, I thought I’d share some of my favourite quotes on the subject of Decadence. 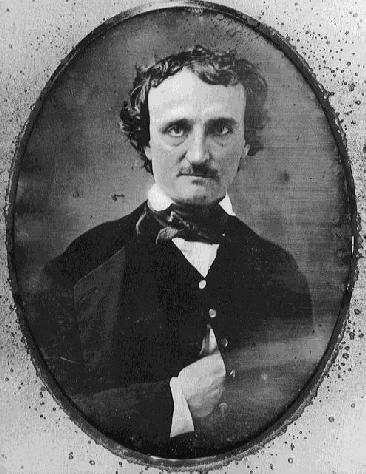 A little Poe for Hallowe’en. Soon again I heard a tapping something louder than before. ‘Tis the wind and nothing more. 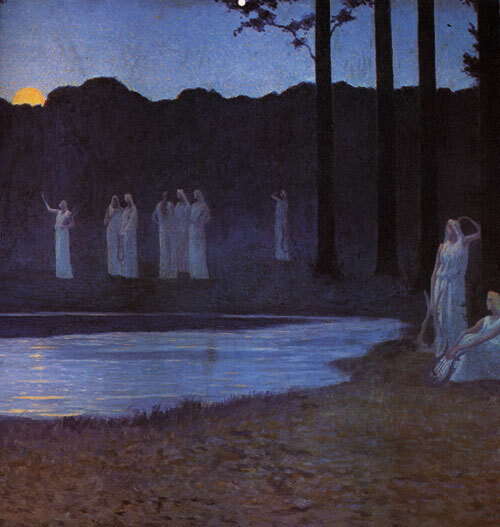 Respite–respite and nepenthe from thy memories of Lenore! Leave no black plume as a token of that lie thy soul has spoken! Leave my loneliness unbroken!–quit the bust above my door!